CARBONDALE, Ill. – An expert on international security whose emphasis is on political violence and civil wars will discuss the recent surge in civil wars worldwide and its impact on the United States next week at Southern Illinois University Carbondale. 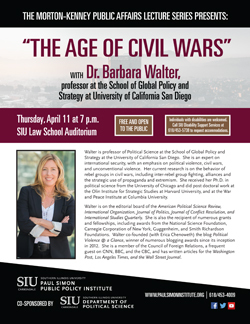 Barbara F. Walter, a political science professor at the School of Global Policy and Strategy at the University of California San Diego, will present “The Age of Civil Wars” at 7 p.m. on April 11 in the SIU School of Law Auditorium. The lecture is part of the Morton-Kenney Public Affairs Lecture Series, presented by the Department of Political Science and the Paul Simon Public Policy Institute. Walter’s research is on the behavior of rebel groups in civil wars, including inter-rebel group fighting, alliances and the strategic use of propaganda and extremism. Walter, along with Erica Chenoweth, is co-founder of an award-winning blog Political Violence @ a Glance that began in 2012. Reporters, photographers and news crews are welcome to cover the lecture. To arrange for interviews or for more information on the event, contact J. Tobin Grant, chair, Department of Political Science, 618/453-3167 or grant@siu.edu. J. Tobin Grant, political science degree program chair, said the world is entering a new age of civil wars. After a decline in the 1990s, the number of active civil wars has tripled since 2003. Walter will discuss reasons for the increase and what the United States can do about it, Grant said. “The rise in civil wars comes at a time when almost all other types of violence are declining,” he said. Civil wars on “the other side of the world” impact the lives of people living in the United States, Grant said. “When civil wars happen, they lead to other tragedies, from terrorism to public health crises,” he said. Throughout her visit, Walter will meet with students from the political science department, Grant said. “This is a unique opportunity for students to interact with a world-leading expert from another university,” he said. A member of the Council on Foreign Relations, Walter received her doctorate in political science from the University of Chicago and did post-doctoral work at Harvard University’s Olin Institute for Strategic Studies and at the War and Peace Institute at Columbia University. She has earned numerous research grants and fellowships from organizations including the Smith Richardson Foundation, the National Science Foundation, Carnegie Corporation of New York and the Guggenheim Foundation. In addition to her many research articles, Walter’s books include “Reputation and Civil War: Why Separatist Conflicts Are So Violent” and “Committing to Peace: The Successful Settlement of Civil Wars,” named in 2002 as one of Choice Magazine’s “Best Academic Books of 2002.” She is on several editorial boards including American Political Science Review; Journal of Conflict Resolution and International Studies Quarterly. Walter is a frequent guest on CNN, CNN International, BBC, Politico and NBC and has written articles for some of the nation’s leading newspapers. Walter is the 45th lecturer in the series, which occurs in the spring and fall of each year. John T. Shaw, Paul Simon Public Policy Institute director, said the series brings “remarkable speakers” to campus twice a year. “The roster of speakers who have been part of this lecture series is strikingly impressive. Professor Walter will fit seamlessly into this great tradition,” he said. The late Jerome Mileur, originally from Murphysboro, was a professor emeritus in political science at the University of Massachusetts-Amherst and retired in 2004 after a 37-year teaching career there. Mileur established the series in 1995 in honor of two of his political science professors — Ward Morton and David Kenney — who inspired him as a student. Mileur, who died in September 2017, earned his bachelor’s degree in speech communication in 1955, and a doctorate in government in 1971, both from SIU Carbondale.